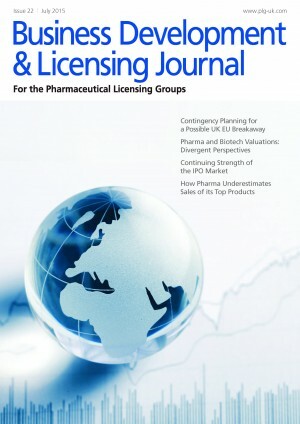 Subscription to the Journal is included within the PLG Membership package. Members: login to access current and past issues of the Business Development & Licensing Journal. Over at least the past decade, risk-adjusted net present value (rNPV) has emerged as the de facto standard for valuing pharmaceutical R&D projects.1,2 These valuations are used for several purposes including prioritising projects within a portfolio, making investment decisions, valuing a licensing transaction and valuing intellectual property in a sale setting. Controversies remain, not least the choice of discount rate to apply, but the methodology remains very widely used, at least in big pharma and those biotech companies that have not lost faith in rNPV. This paper briefly documents an alternative risk-profiled MC rNPV valuation (rpNPV), and highlights a material divergence between the perspective of a biotech company (with a single or small number of projects) and big pharma (with a broad portfolio). There is no denying the last 18-24 months have seen an unprecedented uptick in the number of companies rushing to the take advantage of the wide open initial public offering (IPO) window. Between the beginning of 2013 and the first quarter of 2015, 144 companies have come to the market, as new issues have been enthusiastically embraced at a level not seen since the genomics bubble of 2000. Pharma companies are good at identifying the products that will become big successes at the time they launch them. But they wildly underestimate how successful these products will become. It is not that companies have failed to identify them as future successes. It is just the sheer scale of the success that they fail to fathom. Almost half way through the year and May has seen a slightly top-heavy Deal Watch Table with two corporate acquisitions with headline values of over US$8bn. However, this month saw the smallest number of corporate acquisitions in the year to date, when compared with the previous months in 2015. The aggregate value of the top 20 deals was also down from the previous month where we reported the high value AbbVie/Pharmacyclics acquisition at $21bn.